Mr. Abdulaziz is an experienced and award winning CIO in charge of the entire IT infrastructure of the KNPC. Mr. Abdulaziz has been working with the KNPC IT-Department for the last 30 years and is currently working in capacity of IT Manager. 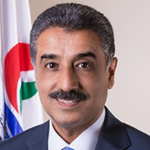 Mr. Abdulaziz was a member in Kuwait E-Government Committee from 2004 to 2005. He has served as Board Member and undersecretary at Kuwait IT society from 1991-2006, as General Manager of AWARE Center and TIES Cultural Center from the year 2003-2006 and 2009-2011 respectively and is an active member of Kuwait Engineering Society since 1988. A leader in innovation and digital transformation as well as a key figure in Kuwait’s social technological communities, Mr. Abdulaziz has proved himself as an integral part of Kuwait’s IT Society. Check out the incredible speaker line-up to see who will be joining Abdulaziz.